The market kept climbing last week and didn’t stop for any of the resistance levels we had expected. It’s also not bothering about the current lunar red period. What’s going on? The S&P is back within the range it held from February until August. The next major overhead resistance is now at 2100-2130. The Earl (blue line) has dropped a bit but appears to turn back up. 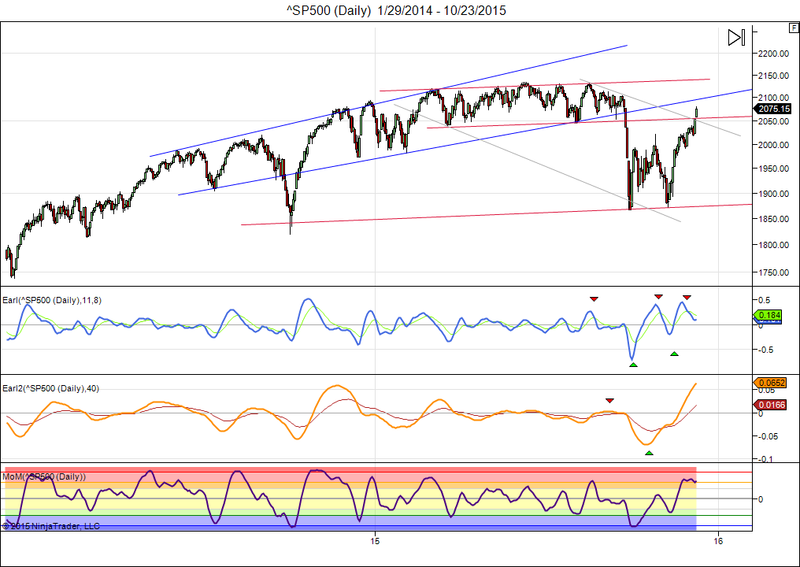 We could be going to a bearish divergence in this indicator. The slower Earl2 (orange line) is still going up but getting very high. This looks like a market that is more than ready for a pause, so I don’t think there is much upside left at this point. For the first time since late 2013 we see some significant bullish energy (green) enter the picture. In 2013 the rallies ended in massive overheating (red lava) followed by major corrections. My downside target of $180 was reached earlier this year and a nice base has formed just above $200. A very long period of “floating ice” has just ended and bitcoin is slowly heading higher. How high can it go? I don’t know, but with this chart $500+ is certainly not out of the question. As I wrote in 2013, the value of a crypto-currency will start to depend on real intrinsic value that becomes tied to it in some way. It is now clear that this can also be the value of services that are being connected to blockchain technology. This is starting to happen with Bitcoin and also with newer implementations like Ethereum. This entry was posted on October 26, 2015 at 1:40 pm	and is filed under Financial Astrology, Market Commentary. Tagged: Bitcoin, ethereum, iceberg, lunar cycles. You can follow any responses to this entry through the RSS 2.0 feed. You can leave a response, or trackback from your own site. he says market may have cycle bottom, but crude will go down some more. People say this every year. If it was to break into the mainstream it wont be next year. Maybe in 3-5 years but not any time soon. Bitcoin has been moving very slow for over a year now and unless some massive corporation or industry gets on board it’ll probably be another slow year.